When California resident June Emerson snapped a photo of her children playing at the beach, she didn’t expect it to generate international news. Although the kids seem to be adorable, that isn’t what captured the attention of the media. In a wave behind them, you can see the outline of a large animal swimming by (or being “terrifying” and “creeping up on them,” as the Daily Mail called it ). The media, including local, national , and international outlets, wasted no time in calling it a shark. However, as Jason Goldman wryly noted , “not all grey things with dorsal fins in the ocean are sharks.” This animal is almost certainly a dolphin. I asked a dozen shark scientists and a handful of dolphin scientists, and all quickly agreed that this is a dolphin. As I’m no fan of merely appealing to authority (though I’ll trust someone with years of training over the painful to read comments on many of the news pieces), I’ll share with you how we can tell. First, let’s clean up and brighten the image. Since I am not a photoshop master, let’s borrow a cleaned up and enhanced image from KTLA. Original image by June Emerson, enhancement by KTLA. Even though the image is somewhat blurry (understandable, as June was trying to photograph her children and not the animal behind them,) there are still easily identifiable features that clearly show that this is not a great white shark, but a dolphin. Lets compare the rough outline of a great white shark with that of a dolphin (images are from Wikipedia, H/T to Pete Thomas for finding them and pointing them out to me). On a great white shark, the pectoral fins are relatively far from the head and relatively close to the first dorsal fin (#1) . Like all sharks, great whites have a second dorsal fin (#2). 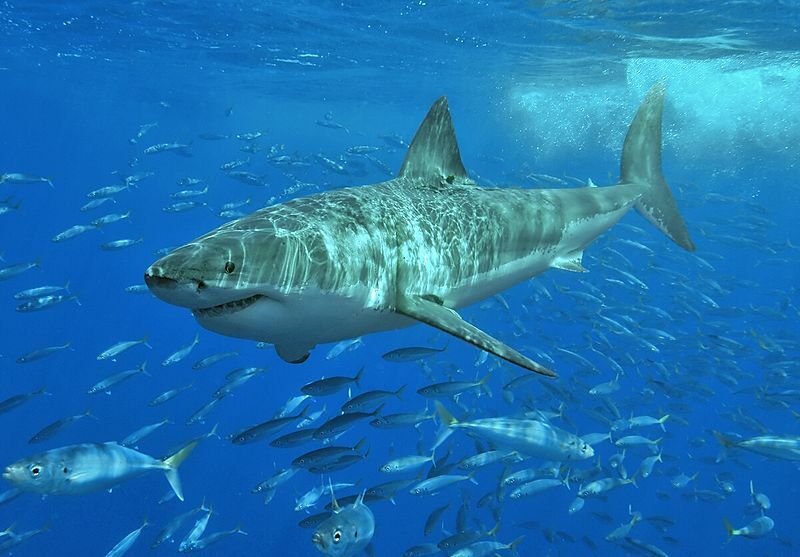 Like all sharks, great whites swim by moving their tail side-to-side (#3). Though I used a side-view drawing for convenience, these features are all easily seen on the real thing. On a dolphin, pectoral fins are relatively close to the head and relatively far from the dorsal fin (#1). 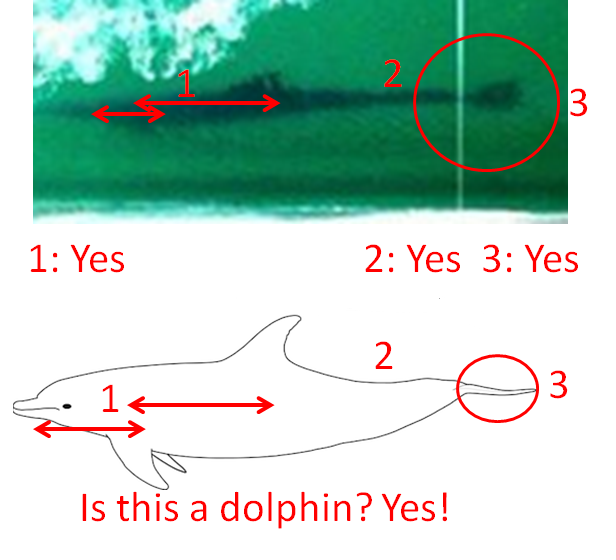 There is no second dorsal fin (#2). 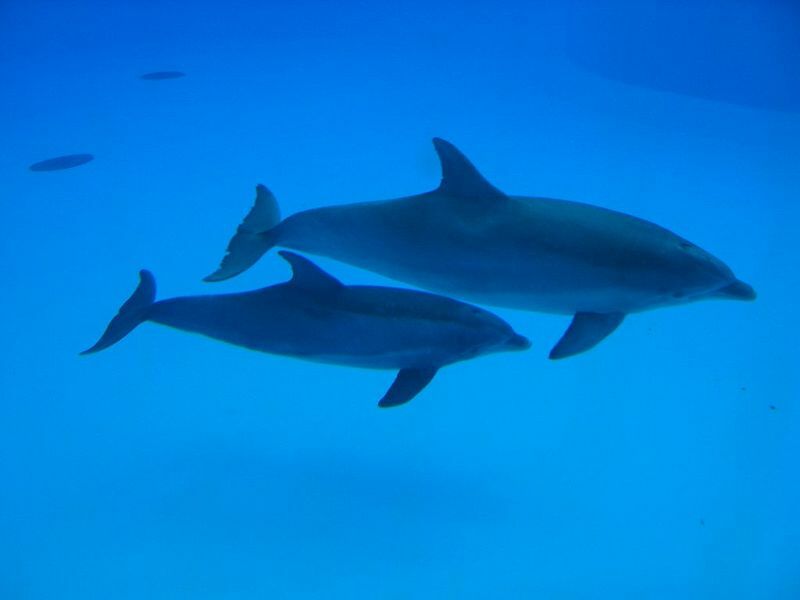 Unlike sharks, dolphins swim by moving their tails up and down, resulting in a drastically different tail shape (#3). Again, these features are all easily seen on the real animal. 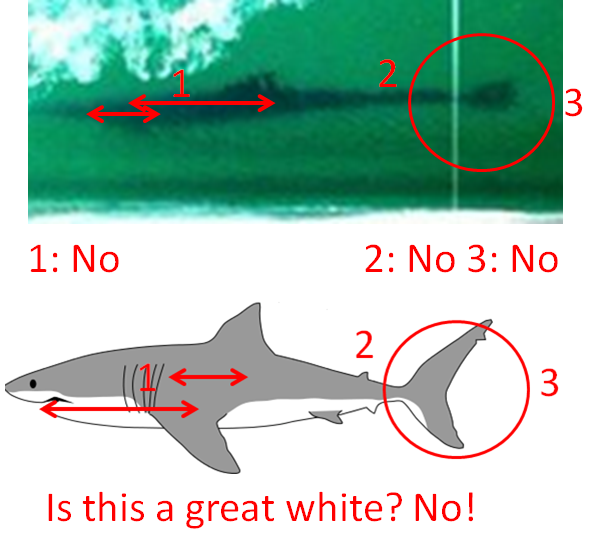 So, now that you know what to look for, let’s compare June’s image with the features of a great white shark. Now let’s compare June’s photo with that the features of a dolphin. In a pseudo “debate” with me (we never actually communicated directly) for CNN , Shark Week producer Jeff Kurr noted that there have been a lot of juvenile great whites in this area. That’s absolutely true, and it’s a good sign for the conservation of the species. However, that’s hardly evidence that this is a great white. He didn’t note that there are also a lot of dolphins in the area, and that they’re often observed surfing in the waves. The cynic in me can’t help but notice that many news articles noted within the text of the article that this could easily be a dolphin, yet hardly any used “dolphin” in their headline. It isn’t hard to imagine an editorial discussion along the lines of “eh, it may be a shark, it may be a dolphin, more people will click the link if it talks about a big scary shark near cute innocent children.” Though not exactly rare, this kind of fear-mongering “if it bleeds, it leads” journalism has had a significant negative impact on public perception of sharks, and by extension shark conservation policy, and by extension the population status of threatened species. June and her children were in no danger, which also would have been true if the animal photo-bombing them was a juvenile great white shark. Many species of sharks are in danger, and sensationalist journalism such as much of the coverage of this “photobomb” does them no favors. Experts debate beach photobomber: Shark or dolphin?